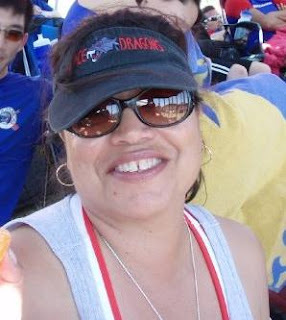 Space Dragons Dragon Boat Racing Team: Paddler Spotlight - Marina! I was born in Long Beach, CA; when I was 5 yrs old, we moved to Omaha, NE for 2 years and then to Jacksonville, FL for 3 years then Washington D.C for another 2 years; we returned to Long Beach when I was 12 years old and I have lived in the Long Beach/Carson area most of my adult life, except for 2 years in West Germany, when I was 18 years old. Filipino food and fish, salads and I love sweets! At first it was just to incorporate another means to workout, now I'm addicted to medals. Last year when the Red team was in the finals at LB, my manly coaches showed how proud they were of the entire team, what an moment for SD...FINALLY we are the 'big boys'. Also, Monday night dinner in Vancouver, I enjoyed watching you all put down some food, especially Sammie, where did you put it????? I have lots of plates, I could feed over 100 people with my current collection of plates. I just think at any meal you should have a choice of what color or type of plate you use. I also crochet afghans and scarves; I love to bake and cook, it's relaxing. Stick with it, we are a GREAT team of people on and off the water. My personal goal is get 'lighter' and move out of the engine room...oh yeah, and keep my eyes on the strokes. Nothing...I just love this team! practice, you'll be much better when you leave. Wade...a great coach, he's full of fun, but 'mean' on the water (in a positive way). What a athlete, he sets the bar high for himself and the team and respects everyone...BTW, he could sell anyone the Brooklyn Bridge....love you Wade! It's 50th birthday this year; I thought I would be depressed about it, 50 is so 'old'... But I'm happy and proud to be 50...I think they call 50 the new 40's. Most of the time I feel 40ish. liking the sport; I started practicing with SD on the off-season and asked to join the team, I think Joe may now be sorry he said yes!